The World Didn’t End – So Buy Gold? Here is the updated score: # of times people have correctly predicted the end of the world: ZERO. Some scientists may disagree with that statement; apparently a large percentage of life on earth has been wiped out a few times before, and it can take 30 million years for the world to recover, but I wasn’t around then, so I don’t count those cataclysmic events. Yes, the world is still here. In fact, the world of last year is still here. It would appear that we are living in a loop. Remember what happened to gold last year? (If you read the Buy High Sell Higher Forum you already know the answer to this question, since onlooker already discussed it). As you can see in this chart of gold, for the period October 1, 2011 to March 30, 2012 (click to enlarge), the price of gold was smashed from about $1,770 on December 1, 2011 all the way down to $1,525 just before New Year’s Eve, a drop of about $250 in a month, or almost 14%. 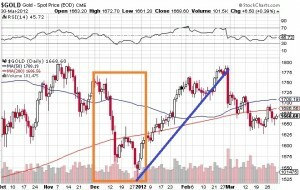 But then, from that low, the recovery began, and by the end of January gold was back over $1,750. So, last year, the correct strategy was to sell gold at the start of December, let the Bog Boyz crush it prior to year end, and then buy it on New Year’s Eve, and ride it back up in the first two months of the year. It would appear that a similar pattern is emerging this year. As recently as November 26 gold was trading above $1,750 an ounce. On December 20 and 21 gold traded below $1,640 per ounce, for a drop of almost 7%. That’s only half of the 14% drop last year, but the year isn’t over yet. It could be that a 7% drop is all we will get this year, so now may be the time to buy. The chart would seem to indicate that $1,640 is a strong support level, since that was also the approximate bottom back at the end of August. It’s quite possible that gold could continue to fall to the $1,560 level or below that it hit in the summer; time will tell. 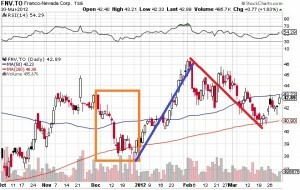 Of more interest to investors is the action in gold stocks. 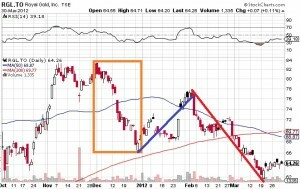 Here is the chart of RGL.TO – Royal Gold Inc. 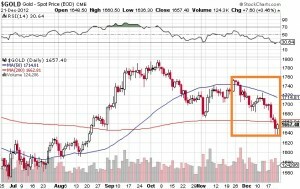 The chart of the month of December, 2011 looks very similar to the chart of gold for the same period. Royal Gold dropped from $84 to$66 in one month, a drop of over 21%, a far steeper drop than the price of gold itself. It would appear that there was more leverage in the stock, as is to be expected. 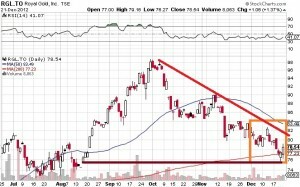 The recovery into February only took RGL back to $78, and then it collapsed to below $62. Royal Gold touched $82.50 on both December 1 and December 12, and traded as low as $75.50 on December 21, for a drop of 8.5% on the month, similar to last year. The question, of course, is the decline over? At the beginning of October Royal Gold was almost $100 per share, so the current $78.54 price looks like a great bargain. I like Royal because it pays an 80 cent dividend, so at current prices that’s a 1% return, which is more than you get in a bank account. As with gold, December 2011 was a lousy month, with FNV dropping from over $43 to under $38, a drop of about 12%. 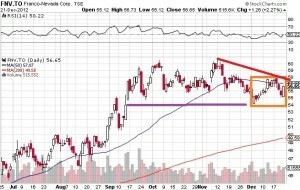 (In mid November FNV approached $45, briefly, for a drop of over 15%). The pattern very closely matched gold, with Franco Nevada recovering to over $46 in a little over a month, for a recovery of over 21%. Again, the perfect strategy last year was to sell at the start of December, buy on New Year’s Eve, and then take profits when new highs were reached. Lather, rinse, repeat. This year the chart is more bizarre, and doesn’t look like the price of gold. This year the low point was at the start of December, and it continued to rise throughout most of the month, trading as low as $54.25 on December 4, and rising to $57.75 on December 18. The close on Friday of $56.65 is higher than where the month started. I could review all of the other gold and silver stocks, but the theme would be similar: gold stocks are leveraged to the price of gold, so the time to take advantage of bargains is at the end of the year. So, as I have time over the holidays, I’l review my list of targets, and place my bets. I’ll keep some cash on hand (in case the Mayans just had their timing off), but I plan to take advantage of the typical January bump. What will happen next year? I don’t know, but now is your chance to once again make your predictions. Deadline for submissions is New Year’s Day. You can check out everyone’s predictions from last year on the 2012 Predictions page (it would appear my predictions weren’t great); we’ll see how we do next year. Thanks for reading, Merry Christmas, and see you next week.